PHOENIX, July 25, 2013 /PRNewswire/ -- Republic Services, Inc. (NYSE: RSG) today reported net income of $56.3 million, or $0.15 per diluted share, for the three months ended June 30, 2013, versus $149.2 million, or $0.40 per diluted share, for the comparable period last year. On an adjusted basis, net income for the three months ended June 30, 2013 and 2012, would have been $156.7 million or $0.43 per diluted share, and $218.4 million, or $0.59 per diluted share, respectively. Republic's net income for the three months ended June 30, 2013 and 2012, includes a number of charges and other expenses that impacted its results. A detail of charges and other expenses that are excluded from adjusted net income is contained in the Reconciliation of Certain Non-GAAP Measures section of this document. Adjusted net income and adjusted diluted earnings per share for the current quarter exclude an environmental remediation charge of $65.6 million, net of tax or $0.18 per diluted share, and costs related to the withdrawal from the Central States Pension Fund of $33.7 million, net of tax or $0.10 per diluted share. Commenting on these results, Donald W. Slager, president and chief executive officer, said, "Excluding accounting charges, the business performed well in the second quarter and in-line with our expectations. We remain encouraged by our improving average yield and volume performance, which we believe results from a strengthening economy." Excluding certain charges and other expenses recorded during 2013 and 2012, as described in the Reconciliation of Certain Non-GAAP Measures section of this document, adjusted earnings before interest, taxes, depreciation, depletion, amortization and accretion (adjusted EBITDA) for the three months ended June 30, 2013, would have been $582.1 million or 27.6% of revenue, compared to $624.8 million or 30.3%, for the comparable 2012 period. Revenue for the three months ended June 30, 2013, increased to $2,111.7 million compared to $2,060.6 million for the same period in 2012. This increase in revenue of 2.5% was made up of increases in average yield of 1.3%, fuel recovery fees of 0.2%, volume of 0.9% and acquisitions, net of divestitures of 0.4%, partially offset by decreases in recycling commodities pricing of 0.3%. For the six months ended June 30, 2013, net income was $180.9 million or $0.50 per diluted share, versus $292.1 million, or $0.79 per diluted share, for the comparable period last year. On an adjusted basis, net income for the six months ended June 30, 2013 and 2012, would have been $324.1 million or $0.89 per diluted share, and $359.2 million or $0.97 per diluted share, respectively. Republic's net income for the six months ended June 30, 2013 and 2012, includes a number of charges, other expenses and benefits that impacted its results. A detail of charges and other expenses that are excluded from adjusted net income is contained in the Reconciliation of Certain Non-GAAP Measures section of this document. Excluding certain charges and other expenses recorded during 2013 and 2012, as described in the Reconciliation of Certain Non-GAAP Measures section of this document, adjusted EBITDA for the six months ended June 30, 2013, would have been $1,151.2 million or 28.0% of revenue, compared to $1,181.6 million or 29.2%, for the comparable 2012 period. Revenue for the six months ended June 30, 2013, increased to $4,110.3 million compared to $4,043.0 million for the same period in 2012. This increase in revenue of 1.7% was made up of increases in average yield of 1.3%, fuel recovery fees of 0.3% and acquisitions, net of divestitures of 0.5%, partially offset by decreases in volume of 0.1% and recycling commodities pricing of 0.3%. 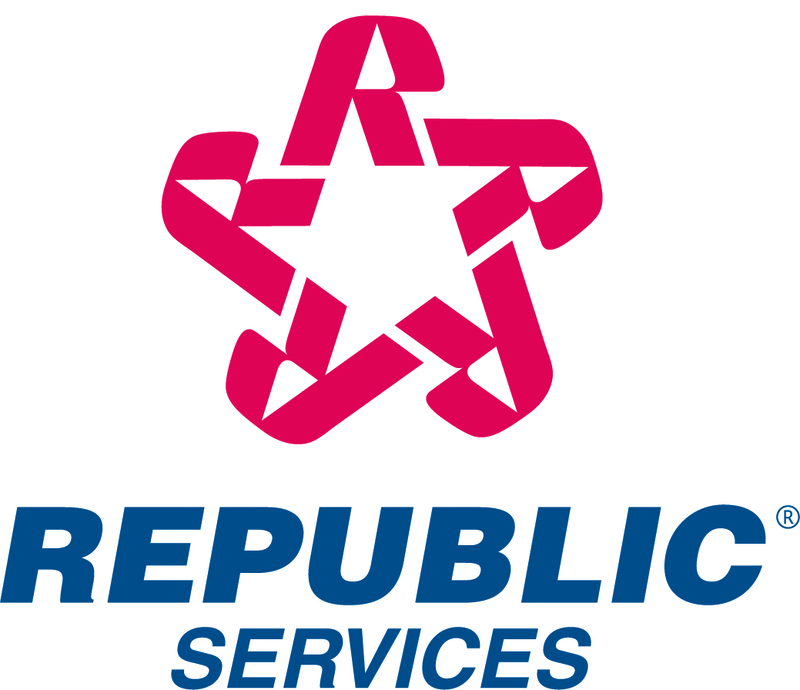 Republic reaffirmed its full year adjusted diluted earnings per share guidance of $1.86 to $1.91. As described in the 2013 Financial Guidance section of this document, a number of charges, including the environmental remediation charge, other expenses and benefits, are excluded from adjusted diluted earnings per share. Republic also maintained its 2013 adjusted free cash flow guidance of $675 to $700 million. Republic's Board of Directors declared a regular quarterly dividend of $0.26 per share, an increase of 10.6% over the prior quarter, for stockholders of record on Oct. 1, 2013. The dividend will be paid on Oct. 15, 2013. This quarter we conformed the terms used to describe components of price in an effort to better align with industry participants. We have not changed our calculation methodology, but we believe use of these terms allow for consistent comparison across the industry. Average yield, which we formerly referred to as "core price," is defined as revenue growth from the change in average price per unit of service, expressed as a percentage. We now use "core price" to mean price increases to customers and fees, excluding fuel recovery, net of price decreases to retain customers. These cost categories may change from time to time and may not be comparable to similarly titled categories used by other companies. We believe that presenting adjusted EBITDA, adjusted pre-tax income, adjusted net income attributable to Republic Services, Inc., and adjusted diluted earnings per share, which are not measures determined in accordance with GAAP, provides an understanding of operational activities before the financial impact of certain items. We use these measures, and believe investors will find them helpful, in understanding the ongoing performance of our operations separate from items that have a disproportionate impact on our results for a particular period. We have incurred comparable charges and costs in prior periods, and similar types of adjustments can reasonably be expected to be recorded in future periods. In the case of the Bridgeton remediation second quarter 2013 charge, we are adjusting such amount due to its significant effect on our operating results. However, in the ordinary course of our business, we often incur remediation adjustments that we do not adjust from our operating results. Our definition of adjusted EBITDA, adjusted pre-tax income, adjusted net income attributable to Republic Services Inc., and adjusted diluted earnings per share may not be comparable to similarly titled measures presented by other companies. As of June 30, 2013, accounts receivable were $876.5 million, net of allowance for doubtful accounts of $43.0 million, resulting in days sales outstanding of 38, or 25 days net of deferred revenue. In addition, at June 30, 2013, our accounts receivable in excess of 90 days old totaled $56.5 million, or 6.1% of gross receivables outstanding. In April 2013, we paid a cash dividend of $84.9 million to stockholders of record as of April 1, 2013. As of June 30, 2013, we recorded a quarterly dividend payable of $85.1 million to stockholders of record at the close of business on July 1, 2013, which was paid on July 15, 2013. In July 2013, our board of directors approved an increase in the regular quarterly dividend of 10.6%. The quarterly dividend of $0.26 per share will be paid on October 15, 2013 to stockholders of record on October 1, 2013. We have had a share repurchase program since November 2010. From November 2010 to June 30, 2013, we repurchased 33.1 million shares of our stock for $960.6 million at a weighted average cost per share of $29.00. During the three months ended June 30, 2013, we repurchased 2.0 million shares of our stock for $68.1 million at a weighted average cost per share of $33.86. As of June 30, 2013, we had 361.8 million shares of common stock issued and outstanding. We believe that the presentation of adjusted diluted earnings per share, which excludes loss on extinguishment of debt, negotiation and withdrawal costs - Central States Pension Fund, restructuring charges, gain on disposition of assets and impairments, net, and Bridgeton remediation charges provides an understanding of operational activities before the financial impact of certain items. We use this measure, and believe investors will find it helpful, in understanding the ongoing performance of our operations separate from items that have a disproportionate impact on our results for a particular period. We have incurred comparable charges and costs in prior periods, and similar types of adjustments can reasonably be expected to be recorded in future periods. Our definition of adjusted diluted earnings per share may not be comparable to similarly titled measures presented by other companies. The risks included here are not exhaustive. Refer to "Part I, Item 1A — Risk Factors" in our Annual Report on Form 10-K for the year ended December 31, 2012, for further discussion regarding our exposure to risks. Additionally, new risk factors emerge from time to time and it is not possible for us to predict all such risk factors, or to assess the impact such risk factors might have on our business or the extent to which any factor or combination of factors may cause actual results to differ materially from those contained in any forward-looking statements. You should not place undue reliance on these forward-looking statements, which speak only as of the date hereof. Except to the extent required by applicable law or regulation, we undertake no obligation to update or publish revised forward-looking statements to reflect events or circumstances after the date hereof or to reflect the occurrence of unanticipated events.